Make sure you have comfortable shoes for hiking/walking, sunscreen for the hot months and plenty of water. Pack a snack and enjoy the view of the canyon after hiking down. 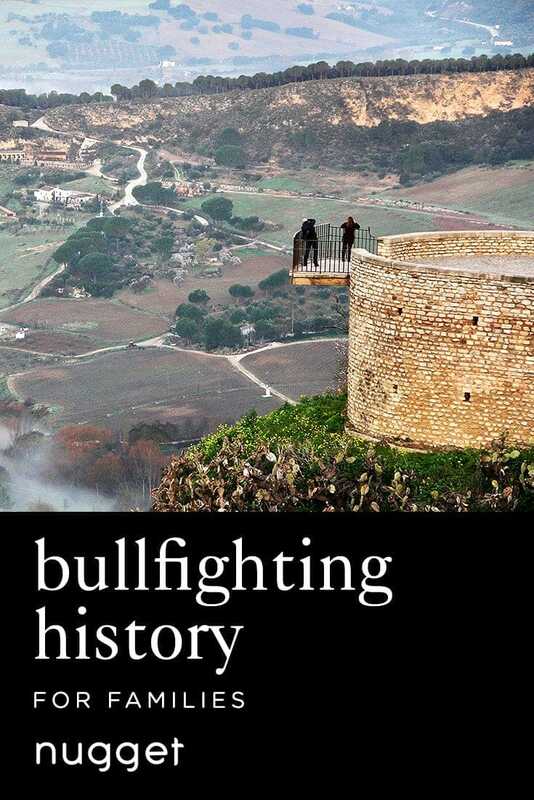 The bullring is perfect for all ages, but you may not want to take toddlers on the hike since there are some steep inclines and no railings. Great for babies that are harnessed or for kids over five years old. Ronda can get hot during the summer months; to avoid the sun at its peak, plan on getting a jump-start with a morning hike prior to the bullring. This is a family-friendly day trip of history, views and adventures! The laid-back, scenic town of Ronda, Spain gives you jaw-dropping views and lots of time to connect as a family in a beautiful setting. Start with a morning hike down the El Tajo Gorge to avoid the hot Adalucian sun, walk across the beautiful Puente Nuevo bridge and finish the day with the fascinating history of Plaza de Toros, one of the oldest bullrings in Spain. Kids will enjoy pretending to be a matador, while grown-ups will happily soak in some history, art and scenery. This trail offers the best views in town and only those who hike down it can get a glimpse of the entire canyon! The gorge was created by constant erosion of the Rio Guadalevín, a river that is fed by the mountain streams and melting snow from high in the mountains of the Sierra de las Nieves. It's the perfect backdrop for a picnic lunch. DIRECTIONS Walk down Calle Tenorio (first calle - or street - south of Puente Nuevo bridge, the street just off of Calle Arminan) toward Plaza de María Auxiliadora. Entrance to hiking trail is directly after the plaza/square, on the right. Depending on your pace and how long you linger at different points it should take you 60-90 minutes to complete the entire out and back trip. TIP Hike with kids 5+ and use a baby carrier if you have younger children. There are steep inclines and no railings. This Puente Nuevo bridge joins the the north and south of Ronda and has the most scenic views on both sides of the city - it was my husband's favorite part of the trip! You can grab a drink at the Parador de Ronda and enjoy the view for hours! The Parador de Ronda is also a great place to stay if you need an accommodation. DIRECTIONS Puente Nuevo bridge is right in the center of Ronda, next to the hotel Parador de Ronda - you can't miss it! TIP Be sure to look from both sides of the bridge! Great for both kids and adults, Plaza de Toros is one of the oldest bullrings in Spain and home to one of Spain's most famous schools of bullfighting. Its architecture is grand, yet the interior feels very intimate. Our kids had a great time exploring the bullring, riding area and museum, and even imagined they were having their own bullfight! We have many fond memories and managed to take home a few prints on display from local artists. Plan to spend around 60 minutes at Plaza de Toros unless you decide to grab a bite to eat in their cafe. DIRECTIONS Plaza de Toros is a short 5-minute walk from Puente Nuevo bridge. TIP Make sure you stop across the street at Alameda del Tajo to get an amazing view of the canyon! WE LOVEDCentral location with the best views in town! TIPBreakfast at the hotel made it easy to get a jump start on the day.